"The Coastal" Collection is filled with the sights and delights of being by the water. Can you smell the water....feel the sun on your face....or remember how relaxing it was? 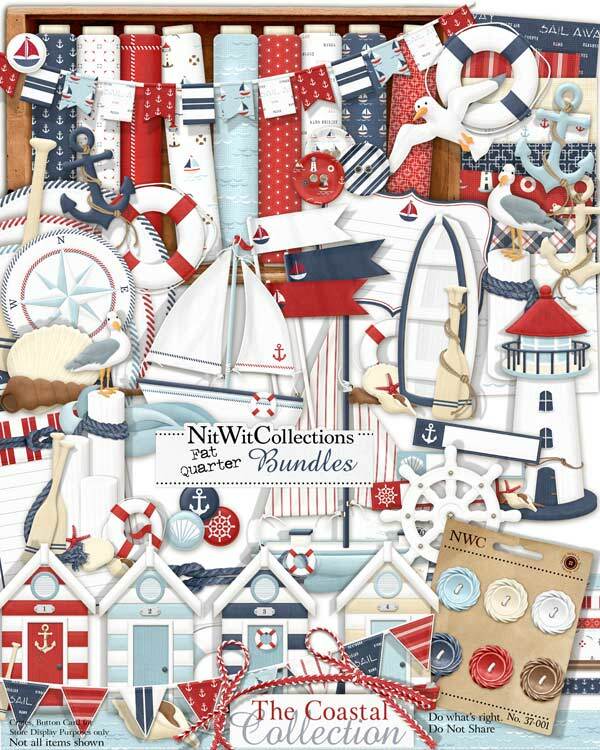 Whether it is the ocean, a cottage, a beach, cruise or even a male theme, this Collection is sure to not disappoint when creating your cards or digital scrapbooking pages. Does this make you want to go back soon??? 3 Anchors in the colours of this digital Collection - now don't drift off, there's more below! 4 Beach huts - please note if there is an item on the door, this means it's occupied!! 2 Bunting strips in differing styles - can you say beach party? 3 Life Preservers - not only will you save a life, but do it in style! 1 Oar - you don't want to be "up the creek" without it! 1 Ship's wheel - as we've taken this, see why we've also given you an oar! ?